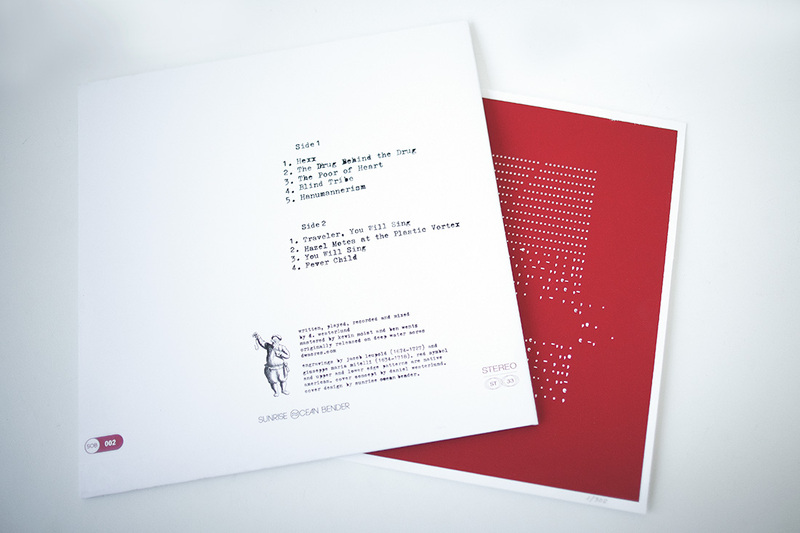 The latest release from Sunrise Ocean Bender, available as limited edition white vinyl in an embossed, varnished gatefold sleeve, is the work of Swedish solo artist Daniel Westerlund who records as E Gone. The music is refreshingly eclectic; electronica, Indian-influenced music, surf, and Sixteen Horsepower-esque Americana are all effortlessly combined, and that’s just the first track! Then in The Drug Behind the Drug we get atmospheric drones, chimes and electronic burblings making for an inventive variation on ambient music. The Poor of Heart is a stripped-down acoustic piece inspired by US folk music. Blind Tribe combines hard-edged rock and electronics with tablas and a slightly folky riff, lurching dizzyingly from one speaker to the other. Traveler, You Will Sing is a bleak and emotional banjo-based track recalling Appalachian folk and the aforementioned Sixteen Horsepower. Hazel Motes at the Plastic Vortex begins as psychedelic folk with brooding ambient drones, putting me in mind of In Gowan Ring. Part way through the track, the ambient side is brought to the forefront, with futuristic electronic drones, backwards guitar, and sci-fi bleepage producing a mind-bending listening experience. You Will Sing is a melodic and relaxing post-rock instrumental, whilst Fever Child manages to bridge the chasm between post-rock and folk. The album is so diverse it sounds more like a compilation than the work of one artist, but for those of us for whom the music itself is more important than its classification, there is a lot to like here. What with this and the recent two-part album by The Movements, Sunrise Ocean Bender is shaping up to be a definite label to watch out for. Visit www.sunriseoceanbender.com.